For this first post, we decided it’s best to start at the beginning. What I mean is the start of craft beer. You see, the first use of the term “Craft Beer” is credited to Vince Cottone, a beer columnist, in 1984. Before this point, the term “craft brewing” hadn’t been used in a publication. 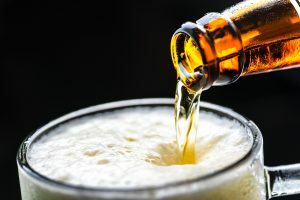 At the time, however, most people knew what Vince Cottone meant when he referred to craft beer because craft brewing wasn’t a new thing to them, it had just found it’s new name. The art of craft beer might be considered to predate the founding of America even under some definitions. After all, if we loosely define craft beer as being brewed at the microbrewery scale, we can argue that the first beers ever brewed were craft beers. Patron Saint of Beer, Brewers, and hop pickers, Arnold of Metz, was born 580 AD and earned his title for saving people from the plague by encouraging they stop drinking water, and instead, drink beer. Before this, the Sumerians (the very first human civilization, back in 1800 BC) had a goddess of beer, Ninkasi. Before the Sumerians, we know very little, because they DID invent written language as well, meaning the art of brewing (and by some definitions, craft brewing) could very well predate human civilization and written language. With all considered, however, you define craft beer, it has been around for quite a while; and with any luck, it will be for a long time. So next time you take part in this time-honored tradition, be sure to remember the great beers and brewers that came before us to perfect the craft in the course of our ~ 4,000-year-old (possibly older) tradition. To learn more about beer check out our site. WEBSITE DESIGN BY THE NIKI JONES AGENCY, INC.